In medical terms, a heart attack is known as a Myocardial infraction or as acute myocardial infraction. During a heart attack, the blood supply to the heart is interrupted, which causes heart cells to die. 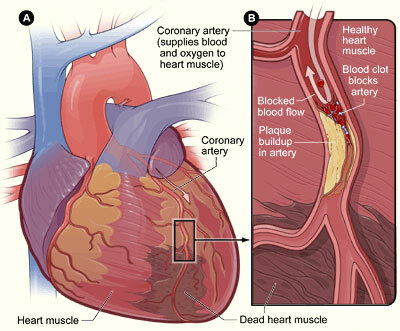 The most common reason for a heart attack is the occlusion, or blockage, of a coronary artery which is succeeded by a rupture of a vulnerable atherosclerotic plaque. Atherosclerotic plaque is an unstable collection of lipids, or fatty acids, and white blood cells in the wall of an artery. Because of a heart attack’s nature to block out oxygen throughout the body, if left untreated for a long enough period of time, the heart attack may lead to damage to the heart muscle tissue or even death. The symptoms of a heart attack can include sudden pain in the chest with a radiating sensation in one’s left arm and left side of his neck, shortness of breath, nausea, palpitations, and sweating, among other symptoms. Women, on the other hand, may experience fewer typical symptoms than men; a woman’s symptoms normally consist of a feeling of indigestion, shortness of breath, weakness, and fatigue. About one quarter of all heart attacks strike silently, with no chest pain or any of the aforementioned symptoms present. Heart attacks are associated with intense exertion; it can come from both physical exertion and psychological stress, especially if one pushes themselves past what his body is accustomed to. Those in poor physical condition have a higher risk of suffering from a heart attack. A heart attack is diagnosed by integrating the history of the present illness and through physical examination accompanied by electrocardiogram findings and cardiac markers such as blood tests for heart muscle cell damage. One procedure known as the coronary angiogram allows visualizations of heart vessels that are narrowing or have obstructions; then therapeutic measure can begin immediately. There are several factors which raise the risk of having a heart attack such as aging, diabetes, some genetic factors, high blood pressure, poor eating habits, drinking, smoking, and chronic kidney disease, to name a few. Historically speaking, more males have had heart attacks than females, but women are more likely to die as a result of the heart attack. One reason for this is the aforementioned symptoms which differ between men and women. Thanks to the advances in medical science, the risk of dying from a heart attack has been significantly lessened. But this does not mean that people can abuse their body as they please, thinking to themselves that doctors will revive them anyway; one must always take good care of his body as it is the only body that he’ll have. Quick and immediate action is the second best way of dealing with a heart attack. One must get help as soon they feel the symptoms for a heart attack. The best way of dealing with a heart attack is by preventing it from happening in the first place. Live a healthy lifestyle and avoid abusing your body too much.